While the official title of the 5th Solvay conference was “on Electrons and Photons”, it was abundantly clear amongst the guests that the presentations would center on the new theory of quantum mechanics. [Planck], [Einstein], [Bohr], [de Broglie], [Schrodinger], [Heisenberg] and many other giants of the time would be in attendance. Just a month earlier, [Niels Bohr] had revealed his idea of complementarity to fellow physicists at the Instituto Carducci, which lay just off the shores of Lake Como in Italy. The theory suggested that subatomic particles and waves are actually two sides of a single ‘quantum’ coin. Whichever properties it would take on, be it wave or particle, would be dependent upon what the curious scientist was looking for. And asking what that “wave/particle” object is while not looking for it is meaningless. Not surprisingly, the theory was greeted with mixed reception by those who were there, but most were distracted by the bigwig who was not there – [Albert Einstein]. He couldn’t make it due to illness, but all were eager to hear his thoughts on [Bohr’s] somewhat radical theory. After all, it was he who introduced the particle nature of light in his 1905 paper on the photoelectric effect, revealing light could be thought of as particles called photons. [Bohr’s] theory reconciled [Einstein’s] photoelectric effect theory with the classical understanding of the wave nature of light. One would think he would be thrilled with it. [Einstein], however, would have no part of [Bohr’s] theory, and would spend the rest of his life trying to disprove it. Complementarity – Wave , Particle or both? 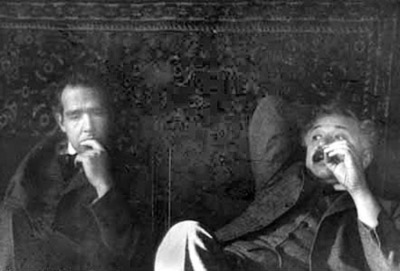 [Niels Bohr] contemplates one of [Einstein’s] many challenges to quantum theory. Where E is the energy of the light quanta, h is Planck’s constant and v is the frequency of the light. The most important item to consider here is this light quanta, later to be called a photon. It is treated as a particle. Now, if you’re not scratching your head in confusion right about now, you haven’t been paying attention. How can light be a wave and a particle? Join me after the jump and we’ll travel further down this physics rabbit hole.